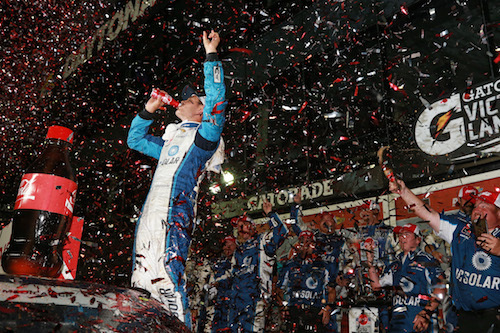 Kyle Larson claimed his third NASCAR Xfinity Series win in four races Friday night in the Coca-Cola Firecracker 250 at Daytona (Fla.) International Speedway. It was his first win at Daytona. Larson wasn’t the first driver to cross the start/finish line on the final lap or take the checkered flag, though. Justin Haley did that, and as a result, thought he claimed his first-career Xfinity Series win in only his second start. But the thrill of victory was replaced by the agony of defeat when NASCAR ruled he made his pass for the lead below the double-yellow, out-of-bounds line. Haley claimed his left tires were only on the yellow line, not below it, but NASCAR officials, after reviewing video, saw the incident differently. Haley wound up with an 18th-place finish as the final driver on the lead lap. The win came down to a side-by-side battle between Larson and Sadler, and Sadler fell just short of a first Daytona win, again. Instead, he finished second for the sixth time in an Xfinity race at the track, including the last three races there. Sadler led for 17 laps, taking his lead from Ryan Blaney on lap 78. He was one of only three drivers to post a double-digit, laps-led tally, the other two being Larson and Blaney. Blaney finished fourth behind Christopher Bell, who overcame a spin and a pit-road penalty to finish third. Kaz Grala rounded out the top-five. Larson won both of the 30-lap stages that made up the first 60 laps of the race. In the first stage, he took the lead from Cole Custer on lap nine and ran up front the remaining distance. Blaney got out of the pits first after taking fuel only during the caution that marked the end of the opening stage, but Larson retook the lead on lap 58 for his second stage win. Ryan Preece started on the pole after rain forced the cancellation of qualifying, but he failed to lead a lap. He retired from the race with a blown engine in with seven laps remaining in the second stage. Just as he did at the end of the first stage, Blaney got off pit road first after the second stage, but this time with a two-tire stop. Other than the cautions to mark the end of stages, the first 70 laps ran caution-free, but the yellow flag was displayed four times in the final stage, two of those cautions for large, multi-car crashes. One of those late-race cautions led to a 12-minute red flag to clean up a crash on lap 82 that included a barrel-roll for Austin Cindric that ended partially on top of the car driven by Joey Gase after contact with Tyler Reddick. Several other cars also were collected. “Definitely the biggest wreck I’ve ever had,” Cindric said. Another crash involving at least seven cars, including Custer’s, resulted in the sixth and final caution on lap 98, extended the race into overtime. Finishing sixth through 10th were Shane Lee, Timmy Hill, Daniel Hemric, Justin Allgaier and Ross Chastain.